Viking knit is an ancient form of circular wire weaving also known as the trichinopoly chain. The term chain is misleading because there are no separate links. The chain is formed with a length of successively looped wire resulting in a long tube which is then stretched. It's known as the Viking knit because several archaeological finds dating back to about the 7th century AD were located in the Scandinavian countries like Norway and Sweden. The Viking knit is still popular today. It's not a particularly difficult technique but it is labor intensive. It is to a certain extent, a forgiving technique because you do not have to do perfect work. There is a very comforting "rhythm" to this technique akin to the repetitive crafts like knitting, tatting and crochet . So some people really enjoy making Viking knit jewelry. A really good step-by step tutorial is the How to Make a Viking Knit Bracelet by Judy Larson. She uses a wooden dowel as a mandrel. Her starting clover has 5 leaves. I recommend 4 as it is easier to space the clover leaves evenly and it's quicker too with one less loop. She also demonstrates how to add on a new wire. This is essential as you will only be working with a manageable length of wire of about 2 feet or so otherwise it will kink too easily. I used a 8mm wooden knitting needle. It's just the right length to rest the lower end against my body as I work! You can see the pen marks I made to position the clover properly before taping it down. I used 22G copper wire for the clover and 26G copper for the first section. I then switched to 26G sterling silver wire. I capture the ends of the wires while continuing to weave after adding new wire. The working wire goes under the ends and then over the ends after making the loop. It's also worth watching the video tutorial by troutstail. There is only one video as he has not uploaded any further parts. But it covers the tools and how an Allen key in a vise is used to start the chain. Allen keys are hexagonal so these lend themselves very well to positioning the clover leaves. After removing the work, get rid of the clover part. Pull the work through the draw plate several times. My 2 1/4" of work stretched to about 6 1/4". Remove the copper heading. The easiest way to finish the ends is to use a length of thicker gauge wire like 20G or 22G to pick up the loops of your actual chain. 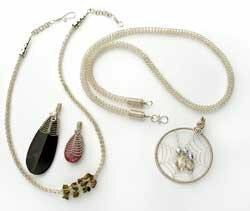 Do a wire wrap and trim. Add a bead cap or cone of some kind before making another wrapped loop for the clasp. Shown at the top and below is my new Etsy listing The Viking Knit Sterling Silver Bracelet (Life Collection - 100% of net proceeds go to cancer research). Perfect finish is a free pdf download from Beading Daily (update : no longer available) by Kathleen Pierce. This is a must read as the author shows you all the tips and tricks of finishing Viking Knit. As you can see from the picture, you can use Viking knit not just for bracelets but for pendants. There are instructions for a very clever spider's web or dream catcher pendant using this weave. The above instructions were for single Viking knit. If you want to do double or treble knitting, what you need to do is loop 2 or 3 rows above. Note that double and treble knit gives a more substantial look but the resulting chains are less flexible. The author also has an alternative way to add new wire. For more resources, check this article. Thanks for the nudge! Most of the time, Viking Knit is added as a knitting technique in books which also cover other techniques. There is one book that is exclusively Viking. I have added the resource to the blog post at the end. I must add I don't have this book myself as I taught myself the technique from the tutorials I linked in the post. Try it out on your own or borrow other wire books from your local library before you go buying! This is a great technique and easy to learn. It looks good at the end even if it isn't perfect before you pull it through the draw plate. What an intriguing technique! Great tut and photos Pearl! That is so awesome, I always wondered how they did that. Will have to set aside some time and try it out. I think it would look great with some large hole polymer clay beads strung on it. Thanks for finding this for us Pearl! Cindy, Viking knit will look awesome with polymer clay! Good luck with it. It's sometimes difficult to get the even stitches at the beginning. So the copper area allows that. Once into the rhythm, switch over to the real wire. Experienced viking knitters probably don't need to do this. The wire gauge for the actual knitted area can be done with 24- 30G wire. The thicker wires are used for the clovers. I find beginners should use 26G for knitting as it is less likely to kink than finer wire. Same with using 4 loops. Finer wire with 6 loops is lovely. I really like this, now I have another thing to add to my list of things to do. It just keeps growing. But it's so pretty and it looks fairly easy to learn. But how do you know how long to make it, for example a bracelet. Because once you pull it through those holes it slims down and gets longer. It becomes very roughly 3 times longer. So what you do is make it such that is going to be slightly longer than you need. You can remove the excess from the ends to get the right length. Stephanie Eddy has invented a wonderful tool for making Viking Knit. She has also written a great book with lots of eye candy. Check her site www.StephanieEddy.com for complete info. I've been using it for a year and LOVE IT!!! I have the same tool too! I am hoping to post a tutorial on it in the near future. I love Viking Knit and just recently started making chains and bracelets using it. I've been curious about the Lazee Daizee tool for a while. Thanks for the review on your tuturial!!! Hello, I was wondering if you would have any advice as to where to purchase the findings (silver wire, beads, etc). I really would like to buy findings that are made in USA or in Europe. Thank you for the great help !